Who to follow in the world of twiplomacy? When exploring the world of digital diplomacy, one is often confronted by a puzzling plurality of official twitter channels. For instance, the US digital diplomacy apparatus includes President Obama’s twitter channel, Vice President Biden’s twitter channel, Secretary of State John Kerry’s twitter channels, twitter channels operated by official spokespersons of the US government, the State Department’s twitter channel and channels operated by US embassies and ambassadors abroad. Such plurality also exists in Israel’s case where Prime Minister Benjamin Netanyahu often comments on world affairs on his private twitter channel in addition to tweets published by the Ministry of Foreign Affairs, Israeli embassies and ambassadors abroad and even the Israeli Defense Forces. The question that soon arises is who should you follow in the tweetosphere of twiplomacy in order to gain insight into foreign policy? Foreign Offices? Foreign Secretaries? All of the above? This question is a pivotal one for me personally as my research aims to understand how various nations practice the new art of digital diplomacy. Whenever examining a new phenomenon in cyberspace, it is often wise to use the method of crowdsourcing thereby standing on the shoulders of virtual giants. In the case of digital diplomacy, I felt it appropriate to analyze the twitter profiles of Israeli journalists serving as international commentators and examine which of the various digital diplomacy channels they view as important sources of information. In order to do so, I first compiled a sample of twelve Israeli journalists who serve as international commentators in prominent local news outlets. The sample included commentators from public and commercial Israeli television channels, print media, online media, radio stations and bloggers contributing to well established alternative news websites. 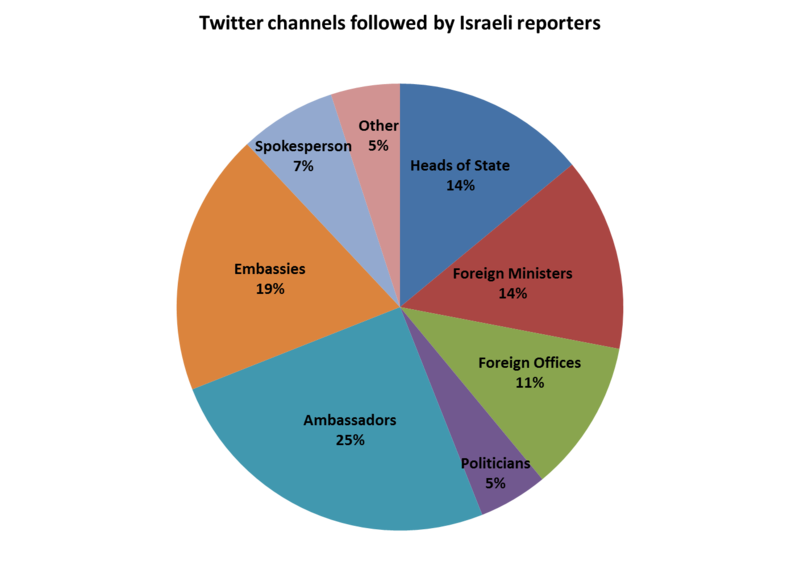 Each commentator’s twitter profile was analyzed separately in order to examine which of the following digital diplomacy channels he follows: heads of state (e.g., President, Prime Minister, Ayatollah), foreign ministers, Foreign Offices, politicians (i.e., other government ministers), ambassadors, embassies, government spokespersons (e.g., White House Press Secretary) and other (the White House twitter channel, Élysée Palace, Downing 10). As can be observed, the commentators in the sample mostly follow twitter channels operated by embassies and ambassadors, be it Israeli ambassadors stationed abroad or foreign ambassadors stationed in Israel. Many commentators also follow foreign ambassadors to international organizations such as the US Ambassador to the UN. It is interesting to note that twitter channels operated by embassies and ambassadors are far more popular amongst the journalists in the sample than those operated by Foreign Offices. Should such results be found amongst a larger sample of journalists, they could indicate that Foreign Offices should place greater emphasis on their embassies’ digital diplomacy channels in terms of activity and the scope of information provided. The fact that foreign embassies in Israel appear to be more popular amongst local journalists than Foreign Offices could also signify that such embassies have been successful in achieving one of the primary goals of public diplomacy, creating the atmosphere necessary for the acceptance of one country’s foreign policy amongst the population of another. By drawing a large crowd of local reporters, foreign embassies are able to communicate their respective government’s foreign policy messages to Israeli audiences. It is also possible that in the world of twiplomacy, embassies have retained the role they played in the offline world as important sources of information for local members of the press. The second and third most popular categories of twitter channels amongst the commentators were those operated by heads of state and foreign ministers. The fact that a President’s twitter channels is more popular amongst journalists than that operated by Foreign Office is less surprising as the headline “Obama vows to maintain Ukrainian integrity” trump the headline “White House concerned over Ukrainian integrity”. A fascinating question of course is who actually operates Prime Minister David Cameron’s twitter channel? The British PM himself? His political aid? Or maybe, the British Foreign Office as it is aware of the immense popularity of Mr. Cameron’s channel amongst the world press. Twitter channels operated by Foreign Offices were the fifth most popular category of channels amongst the Israeli commentators in the sample. What was most interesting about this result was which Foreign Offices were followed. All commentators followed the US State Department with a majority also following the UK’s Foreign Office, France’s Foreign Office and Russia’s Ministry of Foreign Affairs. Only a minority of commentators followed other European Foreign Offices and only one followed the twitter channel of an Arab Foreign Office. Thus, it is possible that even in the world of digital diplomacy the geo-political bias of the press towards dominant world powers remains intact as has the relatively narrow prism through which the Israeli media mediates the world to its audiences. Posted in Uncategorized and tagged Digital Diplomacy, Foreign Office, Foreign Offices, Israeli media, Public Diplomacy, Social media platforms, twiplomacy, Twitter. Bookmark the permalink.